MOSCOW: Nursultan Nazarbayev, Kazakhstan President, has resigned in a surprise move. He had been at the helm for over 30 years, since before the collapse of the Soviet Union. The next presidential election was scheduled for next year. In an address to the nation, Central Asian strongman, 78, said the chairman of the Kazakh Senate Kassym Jomart Tokayeva would take over charge. "I have taken the decision to resign from the post of presidency. The mandate of the presidency will pass to the chairman of the senate for the remainder of my presidential term," he said. Nazarbayev had been holding the position since the USSR's dissolution in 1990. He was elected as the first President. The Government had of late been accused of working like a clan system. He secured 97.75% votes in 2015. 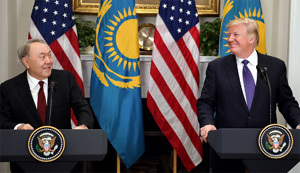 Some sort of turmoil has been going on for some time as the conditions of life in the country had deteriorated, because of which Nazarbayev had sacked the Government last month. Nazarbayev was the only President an independent Kazakhstan had ever known, after the USSR split. He will retain the title Leader of the Nation and head of national security for life and continue as leader of the ruling Nur Otan party. He had close relationship with Russian President Vladimir Putin. Kazakhstan produces 1.8 b barrels of oil per day.